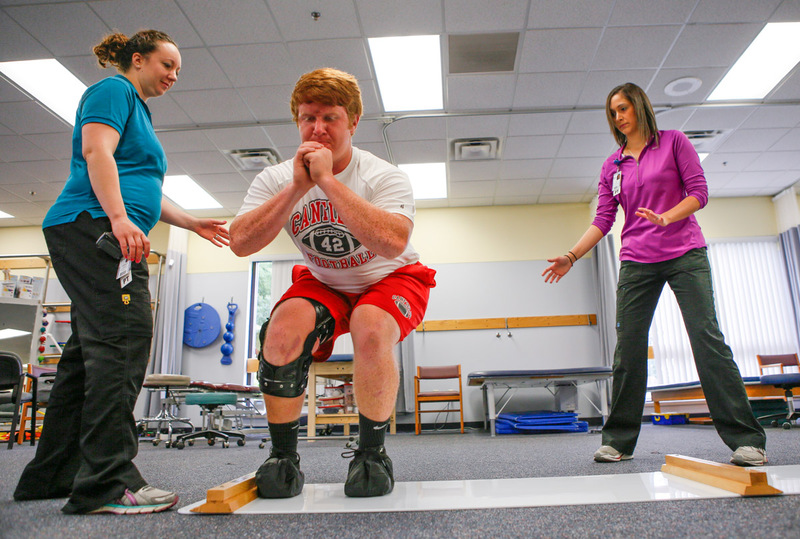 Akron Children’s physical therapists Danielle Johns (on the left) and Erin Shilling work Canfield High senior Cody Holland through a lateral movement exercise. 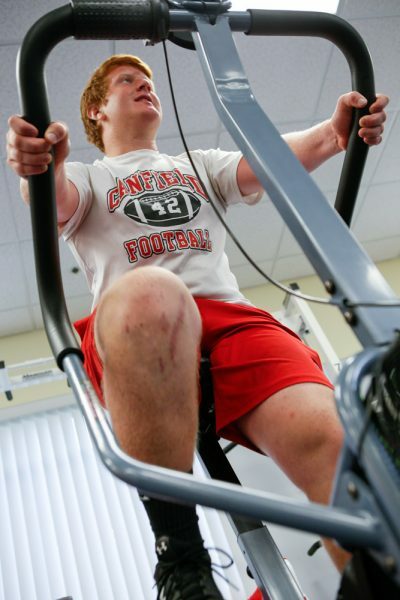 Cody Holland formed a special bond with his Akron Children’s physical therapist that even transcends deep-rooted football rivalries. Holland worked with Erin Shilling, an Akron Children’s physical therapist in the pediatric-focused sports medicine program at our Beeghly campus, for nearly all of his 70-plus therapy sessions after tearing his ACL, MCL and PCL in a season-ending injury in September 2015. Erin played on the rivalry between her alma mater, Poland, and Cody’s school, Canfield, throughout their time together as Cody rehabbed his injured right knee. Canfield and Poland are situated just a few miles apart along U.S. Rt. 224 in Mahoning County. Sports medicine physician Christopher Liebig and pediatric orthopedic surgeon Patrick Riley, Jr., diagnosed and treated Cody after a player on his own team was inadvertently blocked into the side of his right knee during a routine football play. Erin says the sports rehab unit specializes in working with young athletes primarily between 12-21 years old, which sets it apart in the community. Akron Children’s sport rehab unit at Beeghly offers access to the new and emerging interventions in sports rehab, such as taping techniques, soft tissue mobilization, motion analysis, post-concussive rehabilitation and dry needling. As for Cody, Erin expects more than a full recovery from his injuries. More than 3.5 million children ages 14 and under receive medical treatment for sports injuries each year, according to the American Academy of Pediatrics. The most common types of sport-related injuries in children are sprains (mostly ankle), muscle strains, bone or growth plate injuries and repetitive motion injuries. 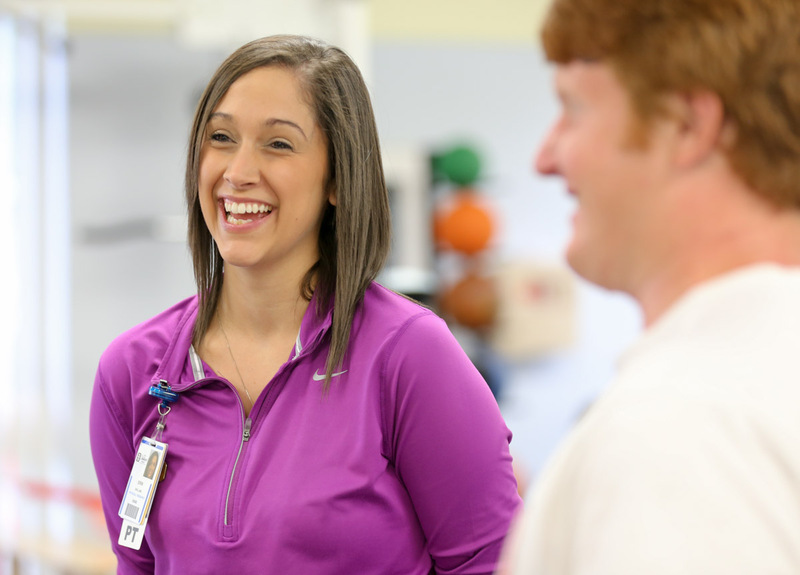 Akron Children’s pediatric sports rehabilitation program includes treatment for these injuries in addition to post-operative rehabilitation, post-injury conditioning, post-concussion rehabilitation and injury prevention. The unit is part of the Beeghly expansion, which will open open in Summer 2017.